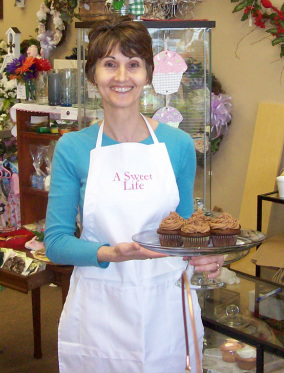 Cheryl Cleary, the owner of A Sweet Life, started the company in October of 2008 with a vision to bring the Cincinnati area a family based craft and baked goods shop. Specializing in homemade cupcakes, candies and cookies. A Sweet Life has grown to serve a large customer base including birthdays, event planners and local business! Come in and see what all the fuss is about. Kelli Cleary, started with A Sweet Life in 2010. As the company grew Cheryl needed to add on extra help to keep up with the cupcake orders. Kelli acts as our 2nd baker, new flavor cupcake creator and recently added tutus to your growing resume. Stephanie Cleary, started with A Sweet Life in 2009. The company began to grow rapidly and Cheryl was unable to keep up with both candles and cupcakes and passed the torch onto Stephanie. Stephanie has been doing the candles ever since!